The travel section of The Guardian this weekend featured this full page ad (see below) from Ski Beat that we found very worrying, even if it’s great for the consumer. The ad itself looks great. 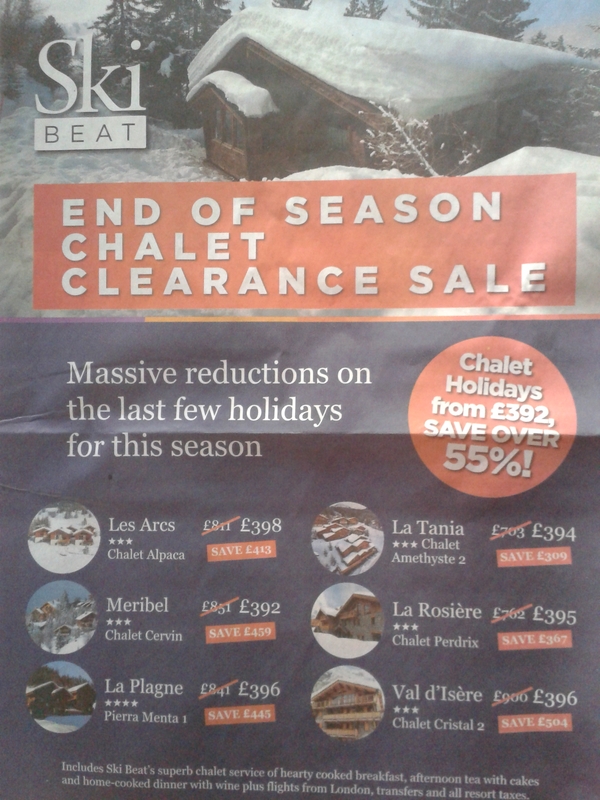 The message is clear: ‘End of Season Chalet Clearance Sale’, with ‘Massive reductions’. And there’s a reminder that you can ‘SAVE OVER 55%’ to a range of resorts. Anyone working in the industry knows this hasn’t been a vintage season for tour operators, with discounting prevalent almost all winter. But booking a full page ad in a travel supplement at the cost of thousands of pounds to then sell holidays at less than half price smacks of desperation. It suggests that this season, for many tour operators, not just Ski Beat, is going to be very disappointing. Deals and a late Easter might lead to a small increase in the numbers of passengers travelling this season – but what the industry reports later this year won’t tell us is how margins have suffered. This ad says that there won’t be many ski tour operators making a profit this season. We’ve just got back from one of Ski Beat’s heavily discounted weeks in Val D’Isere/ La Daille (at nearly half the original price). Two guests didn’t arrive and so the chalet had 8 rather than 10 staying which meant a little less work for the superb chalet host Harriett and a little more personal service for us. The resort was certainly not hectic but boy oh boy did we have fun. A decent dump at the start of the week set us up for a brilliant time untgil our last run back from Follie Douce. We didn’t receive a service from Ski Beat that seemed desperate in the slightest. All staff remained professional, enthusiastic/ passionate about their work and skiing and did nothing to pressurise us for sales of anything. I sincerely hope the season ends on a high note for all the operators.